In the new user interface of PowerPoint 2007, 2010, 2013, 2016, 2019 and 365, familiar menus and toolbars are replaced with ribbon. Some users may find out that useful tool menus disappeared, and they can’t find those original commands any way. 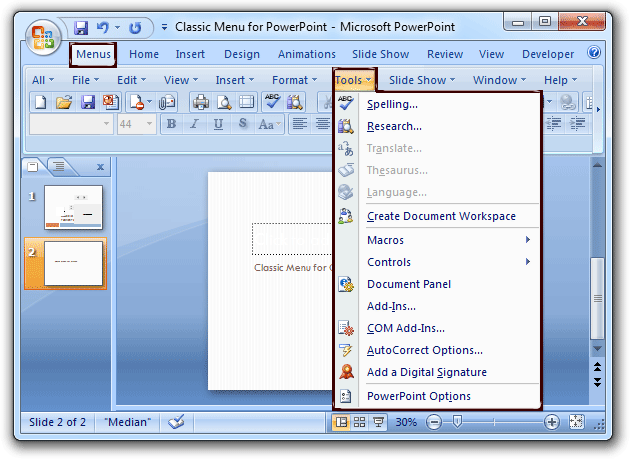 Classic Menu for PowerPoint will restore your original menus and toolbar of PowerPoint 2003. So just going to the Tools drop down menu, you will view all familiar tools menu commands. The new ribbon is designed to make users more productive in PowerPoint 2007, 2010, 2013, 2016, 2019 and 365. Commands and functions are separated into different tabs and groups, so that users can find the right features, discover new functionality more easily and efficient. So the rich-functional tools menu commands are moved into other tabs, and there is no more tool menus command group any more. Here provides the lists of commands that you are already familiar with in PowerPoint 2003, showing you how to accomplish the same results in Office PowerPoint 2007, 2010, 2013, 2016, 2019 and 365.